Published Feb 10, 2017 by Addison-Wesley Professional. Part of the LiveLessons series. 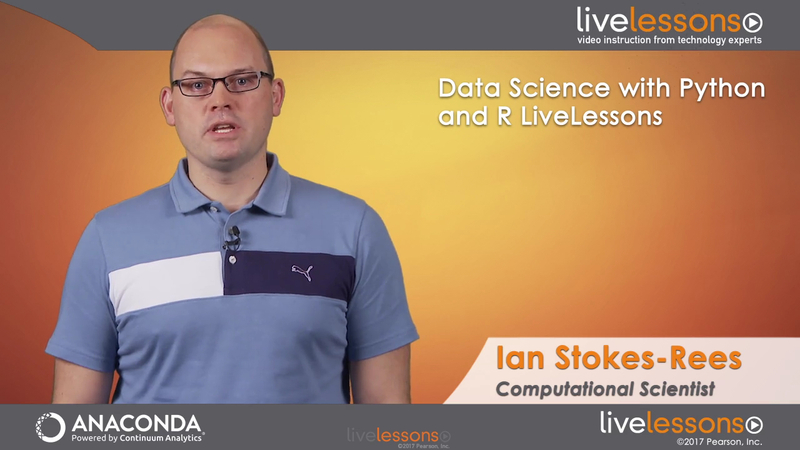 Data Science with Python and R LiveLessons is tailored to beginner data scientists seeking to use Python or R for data science. This course includes fundamentals of data preparation, data analysis, data visualization, machine learning, and interactive data science applications. Students will learn how to build predictive models and how to create interactive visual applications for their line of business using the Anaconda platform. This course will introduce data scientists to using Python and R for building on an ecosystem of hundreds of high performance open source tools. The companion Jupyter notebooks for these LiveLessons are available at https://anaconda.org/datasciencepythonr. Anaconda installed. Python. Anaconda downloads are available for Apple OS X®, Microsoft Windows®, and most Linux distributions. Optionally, Anaconda Trial, which includes features in the paid subscriptions, is available for download. Anaconda is the leading Open Data Science platform powered by Python, the fastest growing data science language with more than 11 million downloads to date. Continuum Analytics is the creator and driving force behind Anaconda, empowering leading businesses across industries worldwide with tools to identify patterns in data, uncover key insights and transform basic data into a goldmine of intelligence to solve the world’s most challenging problems. Anaconda puts superpowers into the hands of people who are changing the world. Learn more at continuum.io.